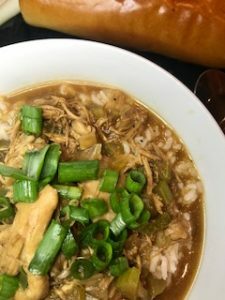 Chicken stew is the perfect weeknight dinner on a cold evening, particularly after a long weekend! 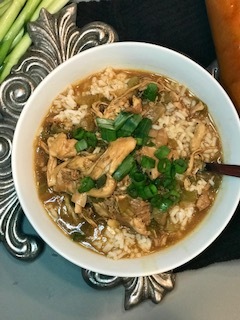 In less than an hour, you can have a genuine Louisiana chicken stew on your table! The flavors and textures are reminiscent of gumbo, due to the inclusion of a savory roux. This recipe uses a prepared roux, however you can use a powdered roux mix or make your own. Learn more about roux here. The basis of this hearty chicken stew is cooking the holy trinity in a roux. The What in a What? 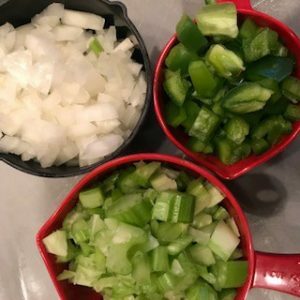 The holy trinity is simply chopped celery, onions and bell peppers sauteed in oil. 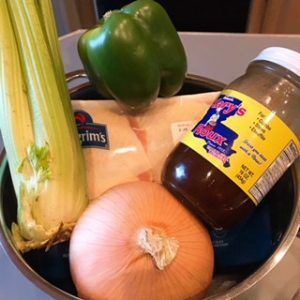 Luckily, the ingredient list for chicken stew is simple and cost-efficient: chicken thighs, bell pepper, onion, celery, jar of roux, oil, chicken stock, green onions and gumbo file (optional). I serve this over white rice, but brown rice works as well. You’ll want to grab a fresh baguette or good old saltines to truly complete the meal. Please comment and rate after you’ve devoured this dish!